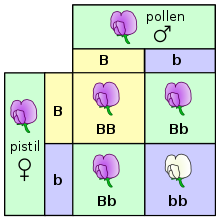 Here the relation atween genoteep an phenoteep is illustratit, uisin a Punnett square, for the chairacter o petal colour in a pease plant. The letters B an b represent genes for colour an the picturs shaw the resultant flouers. The genoteep – a term made bi Dens botanist, plant pheesiologist an geneticist Wilhelm Johannsen in 1903 – is the pairt (DNA sequence) o the genetic makeup o a cell, an tharefore o an organism or individual, that determines a specific chairactereestic (phenoteep) ofthat cell/organism/individual. ↑ Johannsen, W. (1903). 'Om arvelighed i samfund og i rene linier', Oversigt over det Kongelige Danske Videnskabernes Selskabs Forhandlinger, vol. 3, 247-70. German ed. Erblichkeit in Populationen und in reinen Linien. Jena: Gustav Fischer, 1903; Scanned full text. Also see his monograph Arvelighedslærens elementer ("The Elements of Heredity". Copenhagen, 1905), which was rewritten, enlarged and translated into German as Elemente der exakten Erblichkeitslehre (Jena: Gustav Fischer, 1905; Scanned full text. This page wis last eeditit on 3 October 2017, at 19:21.